Excellence shows extremely well with a high degree of owner pride both inside and out.In the forepeak, there is a chain locker followed by the forward stateroom, with a centerline double berth. Next aftis the forward head with a stall shower to starboard followed by the dinette with a galley opposite to port. Up several steps is the main salon, with a sofa to starboard and the main electrical distribution panel to port. This is a great entertaining space with a stereo and a TV. Down several stepsis the aft head with a stall shower to port and a guest stateroom withan over/under berth opposite on the starboard side. Next aft is the master stateroom with a centerline queen bed and access to the cockpit. Up from the salon s the California deck with seating to portand starboard and an aft ladder to the cockpit. bove the main salon is the flybridge with full instrumentation and controls. 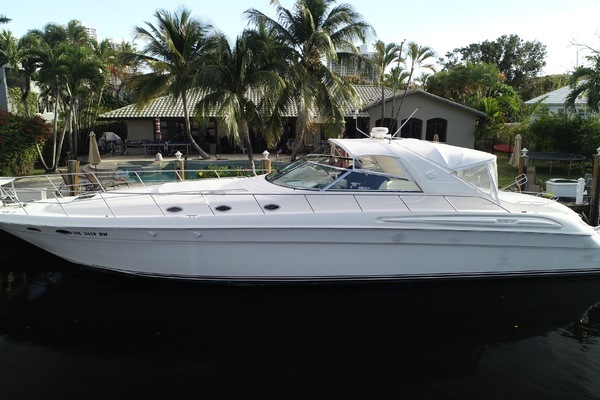 United Yacht Sales New Jersey would love to guide you through a personal showing of this 57' Del Rey Yacht Fisher 1996. This yacht for sale is located in Huntington Harbour, California and priced at $395,000. For a showing please contact us by filling out the form on this page and we will get back to you shortly! Excellence is powered by twin MTU's marine diesel engines, model 6R199TB90, which are six cylinders, turbocharged, fresh water cooled, and rated to produce600 horsepower each. Controls are mathersmicro commander electric. Stainless Steel Bow Rails, Stainless Steel Deck Cleats, Forward Escape Hatch, Fresh/Salt Water Bow Wash Down, Under Water Lights (3), Bennett Trim Tabs, Walker Engineer Fuel Sep, Offshore Marine Lab Water Maker (Disabled), Fiberglass Waste Tank with Jabsco Discharge Pump, Rule Shower Sump, Stainless Steel Opening Ports, Overhead Lights, Berth Lights, California Deck Sofa, California Deck Chairs (2), Aft California Deck Isinglass Enclosure, Kariba Washer/Dryer, California Deck Sink, Fiberglass Hard Top on Aluminum Frames with Four Sided Isinglass Enclosure, Soud Marine Speakers, Stainless Steel BBQ, Window Washers/Wipers, Aluminum Tender Davit (2), Wema Fuel/Water Tanks Gauges, Engine Room Lights, Gyro Gale Pneumatic Stabilizers (4), Fuel Tank Sight Glasses, Electrolysis Corrosion System Monitor, Engine Room Blowers, VDO Engine Gauges, Mingood Intercom System, Delco Remy Bow Thruster, Bose Speakers, Bose Lifestyle Receiver, Direct TV Receiver, Insignia DVD Player, Sharp VHS Player, Head Vent Fans, Rule 2000 Shower Sump, Starboard Cockpit Controls, Molded Non-Skid Decks, Flush Mount Rod Holders (4), Stainless Steel Cleat Fenders, Dock Lines, Cockpit Aluminum Lifting Davit, Port Side Transom Door, Vane Puppy Fuel Transfer Pump, Spare PropellersTENDERS & P.W.C. :The vessel's tender is a 1980, 13ft Boston Whaler, Hull Identification Number BWCH1256M80G, that is powered by a 30 horsepower fuel injected Suzuki outboard.